A very important new report by the Bank for International Settlements (BIS). First solid data that I am aware of since the McKinsey report showed total debts up to 2008. This BIS report comes all the way up to 2010. IMO the debt/GDP going up is only partially explained by the UK GDP reduction - of around 5% since the crisis IIRC. Notice that the data excludes the financial sectors. In this case Ireland and the USA are not as bad as I had thought. France is though. Japan and UK are getting even worse. We knew already that Canada and Germany were fine, and that Spain was as screwed up as us. The UK has the largest household debt / GDP of all of them. Could the US figure be showing a decline not because of repayment but because the loan has been written off? It would appear that the Ireland, Spain, UK and US over the past 10 years have seen a huge boom in household debt, all of this will have contributed to GDP increases. Will the correction have a negative effect on GDP? Govts are certainly helping borrowing figures. You would think with crazy low interest rates people would be deleveraging themselves like mad.. it would appear not. No, the USA debt situation was not as bad as Britain. Remember the famous McKinsey report? Famous in Davos, then Robert Peston linked it to his blog, etc.? (I'll paste it below). The USA is just fixing it much faster than us. I think you are partially right, regarding the "world" economy". But the UK is seriously and deeply fecked. The world will be OKish soon-ishly. Most countries in the world have a cold. Some have a flu. But Japan and Britain have pneumonia. Look at the 2 charts below. We are screwed for at least a decade, maybe 2, and we will never catchup with countries we thought were our "peers", such as France, Germany, and even Italy. Even Brazil will overtake us in a couple of years. We will fall to about 10th place/economy in about 5 years. Sorry. Source: Mckinsey Institute. Link to the full report below (in PDF). The chart in question is on page 10. PS: Note that at the end of 2003 the total debt was almost peaking. But in Dec 2003 Chancellor Brown changed the inflation index, from RPI to CPI, despite BoE's opposition, forcing the BoE to keep interest rates too low. Yes, it was mainly Gordon Brown's fault. Great charts, thanks. We are up sh1t creek without a paddle! Just wish things would get a move on, it's like watching paint dry. They are good. Though sad. Tragic really. People have no idea what is coming. They think the crisis was in the past, or now. It didn't even start yet. We are up sh1t creek without a paddle! Just wish things would get a move on, it's like watching paint dry. I am "Tired of Waiting" too!!! . . . Exactly. 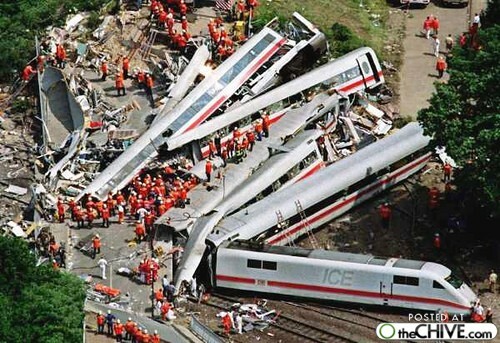 Imagine your train crash image but with a whole country crashing instead!!! Jeeez. It will take at least a decade, perhaps more (probably more?). I have no idea any more. Dewhatage I don't think too many people in the UK know what that word means. You are making a very big assumption that people have enough spare cash to pay down their debts, for many low interest rates just mean they can continue making the payments plus low base rates doesn't necessarily translate to low interest rates for consumers. I don't think most people know what is coming. I don't think they are saving with the required "focus", as much as possible, and paying down debt as much as possible. I think the majority should and could pay down debt faster than they are doing. Thanks for the chart. No surprise here though - M4 keep growing (albeit at low single digit pace). I read the entire review and found it a interesting read. A different prospective to what i normally get. Second, to have a sustained period of growth... and not to fall into a deflationary trap/ Japanese style deflationary period the banks need to purge the bad debts from their balance sheets... its happening in the USA for sure.... but is it happening here? But as the economy recovers it is important to address the problems that led to the crisis in the first place. In addition to, and as a result of, inadequate regulation there was a sharp build-up in private debt, particularly mortgage lending to households, in several countries. And in the British case, made much worse by Gordon Brown effectively blocking the BoE from raising the base rate in 2004, by tampering with the inflation target's index (CPI v RPI) in December 2003. I don't think many people have much too save and then with low interest rates what incentive is there to save. But that is the problem: rates are very low NOW, but they won't be this low forever. People may not have "much" to save, but I doubt that the majority of people with debts (mortgage included) is saving as hard as they can right now. As you said, rates are very low NOW, and the majority doesn't even know how much higher their mortgages could go. I think that the majority is not as worried as they should be about it. It feels like in a phoney war, but worse, as the majority doesn't even know that they are in a phoney war. And are not preparing for it as well as they should and could. I just do not buy all this recovereh talk. Me either. I think they have upgraded us based on the TALK....unfortunately the Torries are not walking the WALK. It's onlt a matter of time to them that matter see this fact. They've been given a life line....will they use it to sort out the country or will they use it to line the pockets of them at the top.....I know which scenario I expect. The cuts as far as I can tell are not cuts. Therefore nothing has changed. We are in with the PIGS. By paying off debt and not taking on more debt they are saving indirectly...the outcome is the same. And the (effective) savings rates are better. The real savers are being mightly taken for a ride. Excellent post and great charts, it is interesting to see the comparison between the different countries. 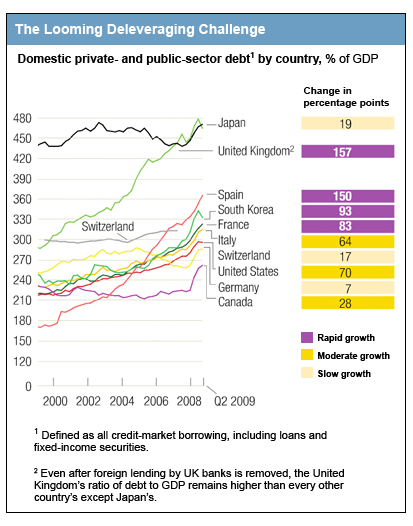 Japan is unbelievable a completely different scale than the others >200% for government debt. 1. france household debt is signifcantly lower than the UK, is this due to less speculation on property/ more renters / property having been held for a long time. Interestingly the french bubble is similar to the UKs so i am suprised that the household debt is so much lower than the UK. 2. I would have thought that Irelands household debt would have been higher, as I thought that the Irish went a bit mad buying property both at home and abroad. 3. Does the reduction in US household debt come from homeowners walking away from property and the increase in government debt come from the buying up of "assets"? The cuts as far as I can tell are not cuts. Therefore nothing has changed. I still think they will cut, in real terms, but not by as much as they are saying. Let's see by how much. But in any case, it will be a very hard decade. We are in with the PIGS. The most sensible have some debt and some savings......it's how you 'manage money' depending on the circumstances that are around and clear to see....a juggling act. Not all debt is bad. Anyone taking on a huge debt to buy a house 15 years ago now would have made a massive return. Those that took on less debt made less money. Thought I guess they need to have the foresight to see and take the profit and wait for the next buying opportunity. Having some sort of cash buffer is essential though...just in case. Over-drafts and credit cards though are a mugs game.